GLCRM and Provencher_Roy Architects consortium are the proud recipients of Canadian Architect’s 2016 Award of Merit for their work on the reception pavilion of Québec’s National Assembly. The award was handed out during the magazine’s 49th Awards of Excellence gala, held in Toronto. Since its inception in 1968, the Awards of Excellence have recognized exceptional architectural projects in the design stage, as reflected by buildings that are interesting from a structural point-of-view while being responsive to social and urban context, meeting client needs with discernment and creativity, and demonstrating awareness of sustainable development imperatives. 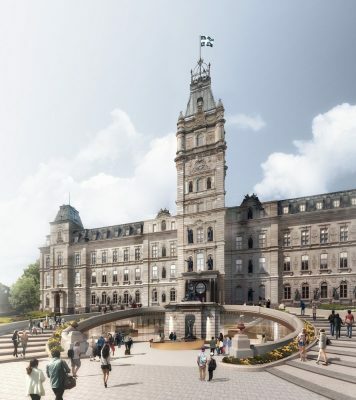 “It was a great challenge to modernize Québec’s National Assembly while preserving the heritage site. 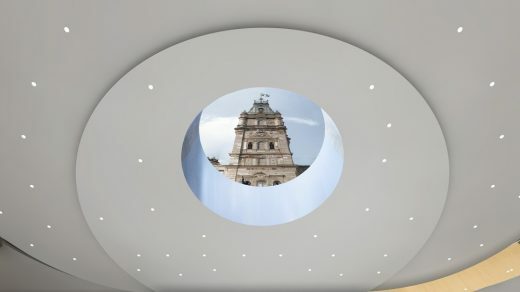 However, by building the reception pavilion underground, we created a discreet space from the exterior that respects the Parliament Building as the symbol of Québec’s identity and preserves the layout of the gardens, thus granting citizens access to a bold and impressive learning space,” explains Matthieu Geoffrion, architect and partner at Provencher_Roy. The facilities of the National Assembly were slowly becoming outdated and in need of revitalization. 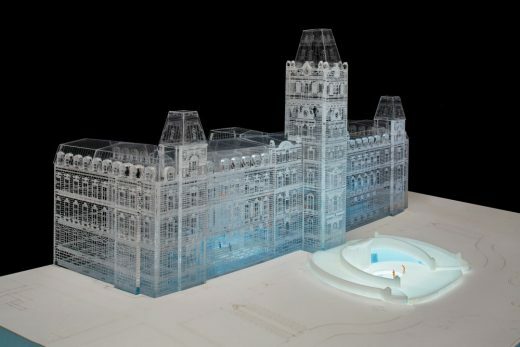 Following the parliamentary reform of 2009, ambitious goals had been established, notably in order to allow more sittings of parliamentary commissions and to give citizens, who were visiting in increasing numbers, greater access to the National Assembly. As well, the security systems in place were no longer adapted to the latest technologies in use and it was becoming urgent to update them to reflect global security concerns. The addition of a reception pavilion thus became inevitable. 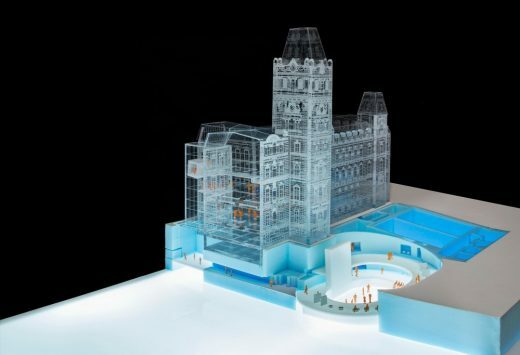 However, it was just as necessary to preserve the Parliament Building, a historic monument designed by Eugène-Étienne Taché, and to showcase it. Its facade depicts the history of Québec, and is one of the rare facades in the world to boast such an iconographic narrative. 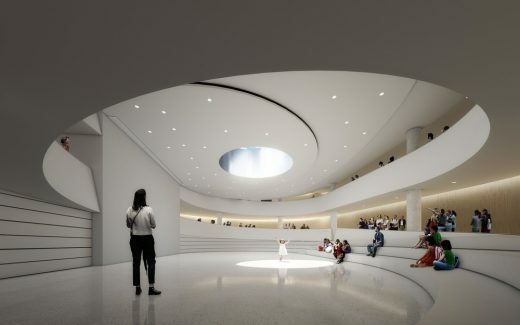 The solution was to create an underground reception pavilion nestled beneath the existing staircase and to link it to an entrance with an elevator, located in the inner courtyard, to allow access to the upper floors. Surrounding the entrance, support spaces have been set up. 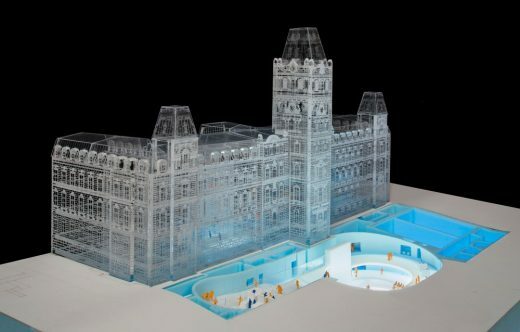 In their entirety, the new structures account for an expansion of 5,100 m2, while completely preserving the heritage context and the interpretation of the Parliament Building. The entrance to the reception pavilion draws the public to the facade. 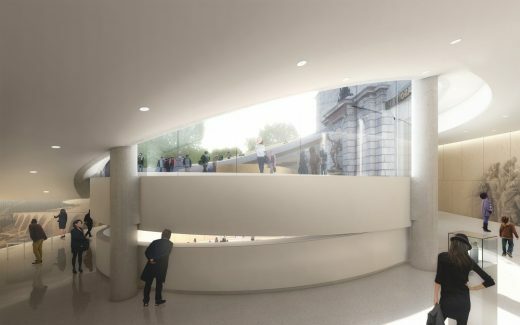 This becomes the starting point of a long ramp that organizes the project’s spaces, with a wood wall that picks up the narrative inscribed on the Parliament Building through images reflecting the milestones of the history—modern, this time—of Québec. Distributed along this ramp are spaces dedicated to security, reception, services and teaching, as well as commission rooms. These spaces are anchored around an agora, a central place that symbolizes the democratic tradition of the National Assembly. Dominated by a giant oculus through which visitors can view the National Assembly’s central tower, the agora—whose volumes are inspired by the Pnyx of Ancient Greece—fosters intersubjective dialogue that emphasizes democracy as an experience. It also evokes the manner in which democracy initially manifested itself. With its gentle slopes and simple lines, the agora is in marked contrast to the National Assembly’s other locations and serves as a gathering spot where boundaries separating any particular groups present therein are blurred. Here, architecture truly is a tool for communication, playing a vital role in raising public awareness of democracy and its culture. Gagnon Letellier Cyr Ricard Mathieu & Associés architects (GLCRM) is a well-established firm in the province of Quebec. For more than forty years, the firm has been combining traditional services in architecture with a multidisciplinary approach, which gathers different specialists with expertise in architecture, interior design, planning and urban design, sustainable development (LEED), BIM and 3D modelling. After serving and developing a clientele of both the private and public sectors in the Quebec City area, the firm began expanding its reach by creating multiple regional offices targeting markets in various regions of the province and elsewhere. 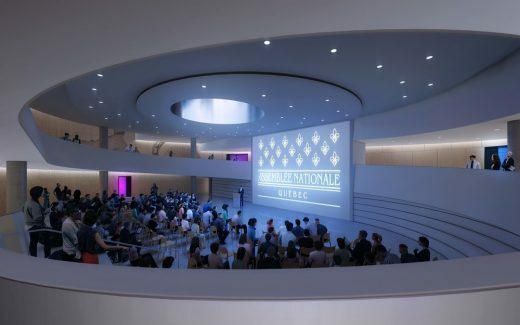 GLCRM’s projects include the Canadian Embassy in Berlin, the Canadian Museum of Nature in Ottawa, the Centre Videotron in Québec City and the Jean-Lesage International Airport. The firm offers a team of fifty architects and collaborators making up a wealth of expertise and experience in all facets of architecture and construction in general. Many staff members, more than half being architects, have been working with the team for more than a decade. This stability ensures continuous knowledge and expertise within its staff, maintaining therefore a high quality standard in the services provided to our clients. The pairing of quality control methods with the pursuit of excellence has earned the team numerous awards and honours from public. Known across Canada for the outstanding quality of its built work, Provencher_Roy is a multidisciplinary firm offering services in architecture, architectural planning, urban design, urban planning, interior design, industrial design and sustainable development. Over the past 30 years, whether designing contemporary projects or remodeling iconic buildings, the firm has had a major impact on Montréal and other Canadian cities. The group’s innovative approach has been to anticipate the impact of architectural conception and design in time and space, emphasizing the concept of openness and a holistic view of a gesture rooted in modernity, which forms an integral part of urban landscapes. Provencher_Roy has also developed, during the last decades, an ability to provide established institutions with a new lease on life. It was a key player in the expansion of the Musée national des beaux-arts de Montréal (MBAM) and in the metamorphosis of the prestigious Ritz-Carleton Hotel. The firm’s portfolio illustrates its outstanding achievements in the institutional sector, as well as in the field of science, education and transportation. Provencher_Roy is currently involved as a partner in the design of the future Champlain Bridge, destined to be Montréal’s vibrant new river gateway. The firm is also working on Iberville International Maritime Terminal and Alexandra Pier restoration and on the Îlot Balmoral, a signature building for the Quartier des Spectacles. Recognized in 2015 as Office of the year by the Royal Architectural Institute of Canada (RAIC), the multidisciplinary firm has received countless architecture and urban design awards in Canada and abroad. Structural engineer: WSP Canada Inc.
Security: CSP Consultants en Sécurité inc.